Learn how to rip convert DVD for Mac OS PowerPC or Mac Intel. Are you using Mac OS X and get confessed by there are some decent software that just do not supported by both Mac OS Power PC and Intel? Usually Mac OS X Intel processor counts a larger amount of "sharing" in the market, therefore these careless software providers always forget about Mac OS PowerPC version users. And this inconvenience ends until the new round of updating on WinX DVD Ripper for Mac from Digiarty Software. Rip DVD to Video and Audio for both Mac OS PowerPC and Intel users. DVD Ripper for Mac is perfectly compatible with Mac computers, working on PowerPC & Intel Mac. It enables both PowerPC and Intel Mac users to rip protected DVDs to those commonly used video formats, including DVD to iTunes, DVD to MP4, MOV, FLV, AVI, etc. This Mac DVD Ripper is able to convert DVD to video formats which are supported by portable devices, like DVD to iPhone, DVD to iPad, iPod, Apple-TV, PSP, etc. It can convert DVD to iTunes directly, so you can enjoy the converted videos by your Apple devices at anytime. For Windows users, WinX DVD Ripper Platinum is fastest DVD to AVI, MP4, WMV, iPhone, iPad, iPod converter and ripper. How to Use This DVD Ripper on both Mac OS PowerPC and Intel? Step 1: Free Download WinX DVD Ripper for Mac, and then import the DVD. You can load from DVD driver by clicking "DVD Disc" or from DVD folder by clicking "DVD Path". This DVD Converter for Mac OS PowerPC and Intel users is available for free download and 5 minutes trial time. 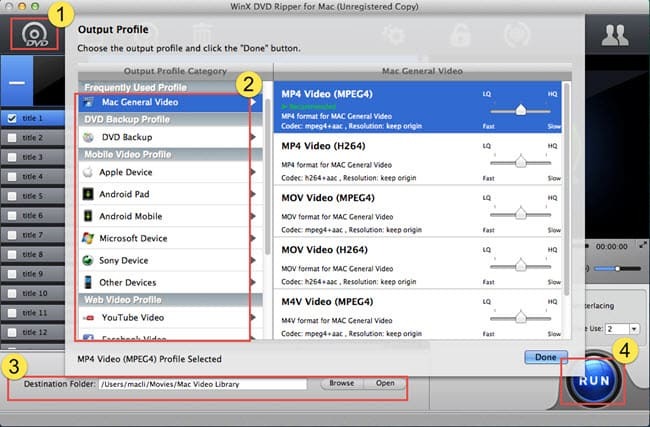 Step 2: After get your DVD disc prepared, you can choose the output settings at the middle of DVD Ripper for Mac, and there are plenty video formats or portable devices optional, like to MP4, to iTunes, to MOV, to Music, to FLV, to iPhone (iPhone Xs included), to iPad, to iPod, to Apple TV, to PSP, to AVI, etc. Step 4: Start Ripping. Click "RUN" button, then the ripping will be started. During the conversion, you can view the conversion progress and are able to cancel the converting process at anytime. What're Mac computer supported video and audio formats? What video file formats and codecs are best for Mac QuickTime or Mac Retina? This guide will give you the answers. Top VR Video Players for Watching VR Content on PC, Mac etc. Looking for the top VR video player software? Come to this article, and see if the recommended VR players can meet your needs to play VR videos or movies. 2019 best free 4K/HD video downloader for Mac (incl. macOS Mojave) to free download any 4K/HD or 1080p/720p videos/movies MP4 from YouTube etc.